Renowned as one of the best in the country, our playground is a bustling, colourful and exciting place to be that combines artful form with function. Make happy memories to last a lifetime as you explore with your kids – feel your heart race as you try to keep up with them, or opt to relax on the sidelines. There are boundless opportunities for kids of all ages to slide down, climb up, run around, scramble over, swing on, find and discover in this vibrant setting. Let kids play with waterworks, explore motion, balance, and simple machines, and learn the workings behind it all. There are enough activities to tire out even the most energetic of children! Like a circus tightrope walker, test your skill on the balance ropes, which are a first for any Australian playground! See how fast you can safely complete the 18.7m-long course and challenge your friends to better it! This is the largest slide in the Darling Quarter playground, and it’s not for the faint-hearted! At over 3-metres high, with a length of 8 metres, you can test your bravery alongside your mates! Up the ramp, count to three, and then whizz away through a grove of trees in a rush of air! What do you mean your local playground doesn’t have a 21-metre long flying fox?! An exhilarating multi-dimensional swing experience for you and your friends! Swing side to side, up and down, or spin around in a circle. There’s room for everyone, so no big lineups! If you love to reach for the stars, the Jumbo Swing is waiting for you! And if you’ve ever yelled “Higher, higher!” on a regular swing, this one will take your breath away as you launch into orbit! This is where you’ll find Darling Quarter playground’s highest point, and the perfect conquest for any budding explorers! 83 square metres of rope net rises over 10 metres into the air, creating an awesome challenge for kids of all ages. Be the first to climb and tell everyone else about the view! Sometimes the simplest things are the best, especially in the sunshine! Make a splash and cool down with Darling Quarter’s 26 water jets and an exciting range of water patterns. Digging a hole and then filling it up again is so satisfying! Just like the real thing, our two Sand Diggers can pick up and move sand around the huge sand pit area, nestled amongst gorgeous palm trees. The perfect way to occupy busy builders in the making! Play it cool and relax in the shade of one of Darling Quarter’s dedicated shaded areas. It makes the perfect spot for a picnic lunch with your BFFs, and it’s close to the Water Screw for a quick chill out! Gravity reigns supreme on our custom-designed hill slides. Race to the top via the specially made rubber mounds, and then launch down the safe, slippery surface for hours of fun and laughs. Do you have the skill to master the Supernova? It’s the ultimate test of balance and strength! Lots of spinning parts means there’s room for lots of kids. It’s whirly fun for all ages. We’ve taken this playground classic and given it a modern twist! There are four big kids’ swings, and two for the little ones, so whether you swing on your own or get a push, there’s plenty of room for everyone in their quest to try and touch the sky! Perfect for younger kids, this tangled web is ready to test your climbing ability. There’s over 42 square metres of rope netting, but be careful not to get caught! Round and round! Faster and faster! How much water can you get splashing around in the Water Scoop? If it’s a hot day, why not splash your friends, your folks, or yourself? They’ll probably thank you for it! Science comes to life! Kids will marvel as the water cascades from the Archimedes water screw. He was the bloke who designed the water pump 2,000 years ago, but even he would be amazed at this one! 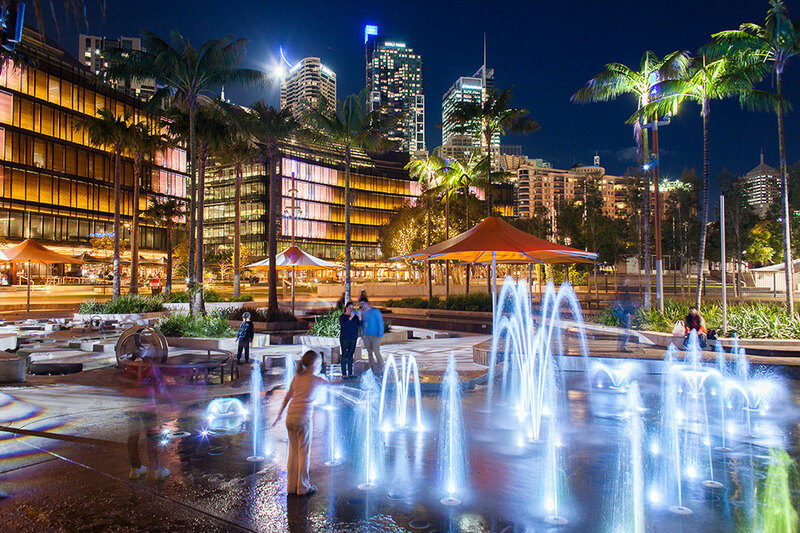 Become the ‘Water Master’ as you decide the ebb and flow of the Darling Quarter Water Works. Control the dam via seven water switches, five water gates, a water wheel and an Archimedes water screw. The power will flow through you!